There is something truly special about the bold yet simplistic architecture of a modern home. Stemming from the International Style of architecture popularized in the 1920s and 1930s, modern homes afford open layouts with connections between indoor and outdoor living spaces, abundant natural light often created through walls of windows, and little ornamentation. February is modern homes month at Sotheby’s International Realty® and to honor this striking approach to architecture, we compiled a collection of inspiring modern homes from around the network, spanning coast-to-coast in the United States, to Australia and Greece. The Panorama Villa is situated in the Olive Grove Neighborhood, one of the most privileged locations in Navarino Dunes. Laid out on two levels with a basement, the villa is surrounded by a private garden. Large openings bring natural light into the residence, creating a seamless transition between indoor and outdoor spaces. Following the design principles of Costa Navarino, which are based on bioclimatic architecture, the Panorama Villa is aligned with the region’s traditional architectural patterns in form, volume and scale. Its finishing, internal outfitting and configuration adhere to the latest standards in architecture and construction. Welcome to the Richard Luke Five-Star Residences at MacDonald Highlands, a collection of modern custom homes affording the Vegas lifestyle you’ve always wanted — minutes away from the Strip and in the heart of a country club community. The exquisitely designed residences, designed by International Architect Richard Luke, embody a five-star amenity lifestyle, and stellar indoor-outdoor living with sweeping views of the city, Red Rock Mountains and the world-famous Las Vegas strip. Located in one of Perth’s most sought-after locations, these stunning beachside apartments marry outstanding design with a contemporary coastal feel. At Overton Terraces, the striking architectural profile created by multi-award-winning Banham Architects have incorporated strong linear expressions with a focus on the internal and external spaces. The modern design focuses on the natural beauty of the spectacular location with the abundance of natural light and pleasant sea breezes. Unique and in a class of its own! Design by Juan A. Figueroa, the creative mind behind the highly acclaimed Williamsburg Savings Bank restoration and conversion, engineering by Jeff Smilow, structural engineer of NYC’s Freedom Tower. The open living, dining and kitchen space is unencumbered by columns and framed by floor-to-ceiling glass walls. Seamless polished concrete floors flow throughout the three levels of this 10,000 square foot house. Custom Scavolini kitchen, two master suites, a flexible lower level space, Smart Home system controls, and more. Located in the enclave of renowned artists: Jackson Pollack, Lee Krasner, Willem deKooning, James Brooks and Charlotte Park. 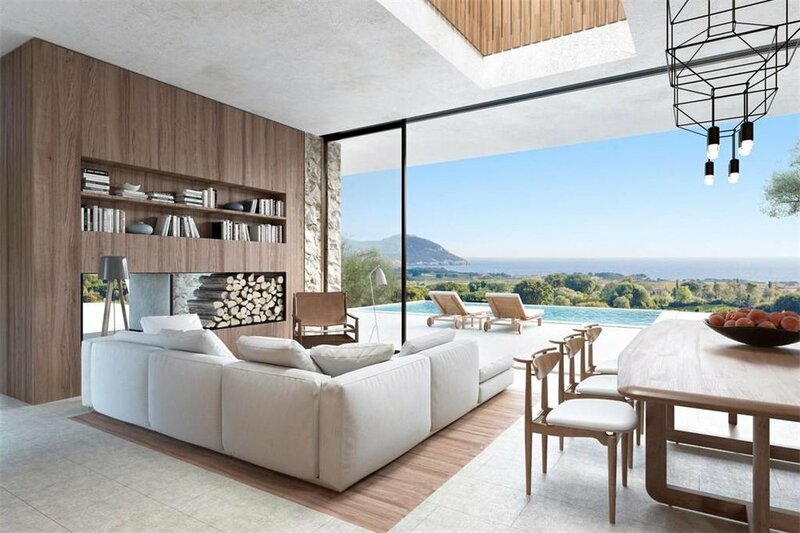 Explore more modern homes represented by Sotheby’s International Realty® here. The Future of Architecture: Unfolding Buildings?